Creating illustrations for print requires knowhow when it comes to preparing image file color for commercial printing. All commercially printed material is produced by using “process” and/or “spot” color systems. 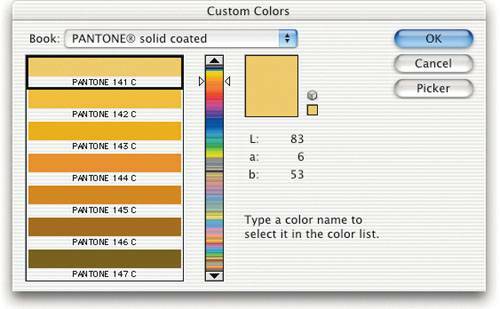 Software programs have built in color selection options to accommodate the needs of commercial printing. Process color is easier to understand and use in file preparation, because there is a standard color space provided for in software for it. Spot color requires a different method for its use and image preparation. This is a basic explanation of these color systems and how they are applied to be helpful to digital illustrators who have not worked directly with commercial printing companies. Also called CMYK, process color is cyan, magenta, yellow and black. The term “process color” originated to classify a “process” of combining dot mesh screening using the CMYK colors in combination to simulate a full spectrum of other solid looking colors and a continuous tone appearance to artwork and photographs. Solid colors are actually “optical” mixtures created by combining flat screen meshes of CMYK. The most common use of process color is in commercial printing where it is called “4-color process printing”. In basic color theory terminology, process color is a subtractive color model, meaning that the overlapping of CMYK colors subtracts from page brightness by absorbing wavelengths of color. The four ink colors used in process color printing. Enlargement of process color screens optically mixing to create colors. A spot color is a solid color of ink that is created by mixing pigments. The term “spot” describes the common use for the ink for printing solid shapes, i.e., spots of color. Spot color is most often used in commercial printing where process color printing is unnecessary. For instance, when printing stationery where only two colors are needed. It is also used to enhance process color printing as a fifth, sixth, etc. additional color. An example of this would be printing 4-color process illustrations in a brochure and printing a fifth color for the logo of the company producing it. Every spot color used in an illustration or design must be custom mixed as a solid color by the printer in the correct quantity. There is no “optical” mixing of colors as there is in process color printing. There are several different spot color ink systems used throughout the world. In the US the primary system used is the Pantone Matching System. Pantone, now a subsidiary of X-Rite Inc., was founded in 1963. The Pantone Matching System, referred to as the “PMS” system, offers 1,677 distinct colors that are created from 15 Pantone base colors including white. 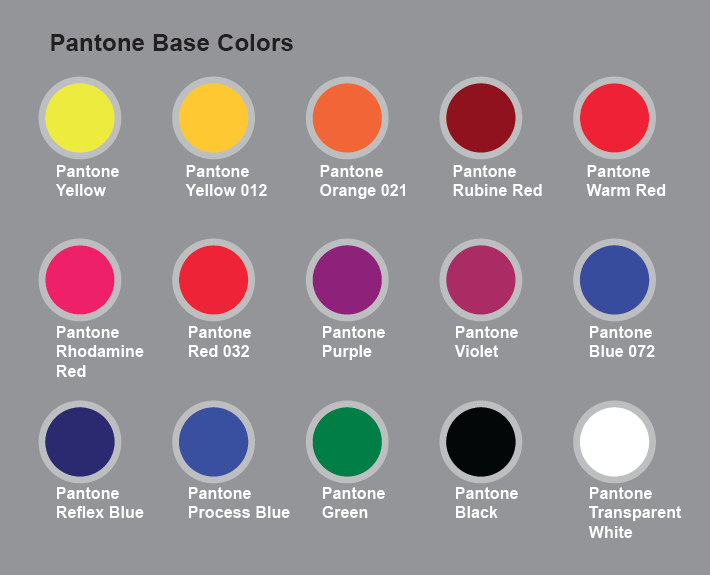 The colors have been standardized by the use of the Pantone Formula Guide. 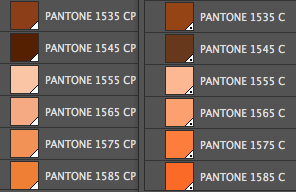 Pantone color selector resident in Adobe Photoshop. Using the guide and the base colors printers can mix any of the 1,677 inks with complete accuracy, so it is possible for two or more printers to print a single publication with remarkable color accuracy. 15 Pantone base colors to mix all the inks in the Pantone Matching System. PANTONE Yellow, PANTONE Purple, PANTONE Yellow 012, PANTONE Violet, PANTONE Orange 021, PANTONE Blue 072, PANTONE Warm Red, PANTONE Reflex Blue, PANTONE Red 032, PANTONE Process Blue, PANTONE Green, PANTONE Rubine Red, PANTONE Rhodamine Red, PANTONE Black, plus PANTONE Transparent White. Although based on the Pantone Matching System, the Color Bridge System was created by Pantone to show what the PMS solid color inks will look like when printed using process colors. There can be substantial color variance between Pantone solid colors and the CMYK interpretations of them due to the narrower gamut of process color printing. (See below.) It is important to note that colors specified in the Pantone Color Bridge will not be printed as spot colors. 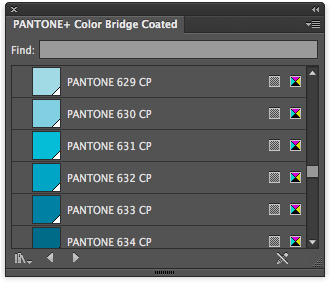 Pantone Color Bridge selector resident in Adobe Illustrator. to Pantone Matching System spot color swatches on the right. Toyo base colors for mixing all spot color inks in the Toyo Color Finder. 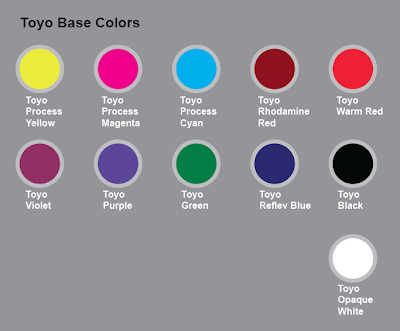 TOYO Warm Red, TOYO Rhodamine Red, TOYO Purple, TOYO Violet, TOYO Green, TOYO Reflex Blue, TOYO Black Tint Base, TOYO Opaque White, plus Process Yellow, Cyan and Magenta. Additionally, Toyo manufactures Pantone base ink colors for use with the Pantone Matching System, the difference being the chemistry in Toyo inks. The pigment, vehicle, and additives used differ than those used by Pantone. A lesser know, custom color system containing 120 spot colors and 3250 tones, the HKS Ink System is in common use in Europe. It was collaboratively developed by three companies, l.Hostmann-Steinberg, Druckfarben, Kast + Ehinger Druckfarben, and H. Schmincke & Co. Introduced in 1990, TRUMATCH is another color system based on the Munsell theory of color. It is a 4-process color to spot color-matching system. Much the same as the Lab Color Space, the TRUMATCH Color Finder system looks at color using a 3-dimensional construct of complimentary color along a vertical luminosity scale. TRUMATCH claims to be more accurate at matching process meshes to simulate solid color than standard digital formula CMYK mixing. The accuracy comes from assigning digital colors from actual CMYK printed samples rather than from RGB color representations on-screen. The result is “wysiwyg” color. Patented in 1984 in Wales, FOLCOLTONE stands for “FOur-COLor-TONEs”. The FOCOLTONE system uses the four process colors, CMYK, as base inks for mixing solid colors to match 763 process colors. The CMYK inks are used in varying percentages to make each of the 763 mixed ink colors, 860 colors in Adobe Software. A FOCOLTONE color formula would be specified in Grams and look like: 0 Cyan, 5.26 Magenta, 14.59 Yellow, 5.54 Black, and 74.61 Transparent White. Formed in Japan in 1907 and incorporated in 1937 as Dainippon Printing Ink Manufacturing, Most popular in Japan the DIC Color System Guide. Very similar to the Toyo Color Finder system, DIC Color is a spot ink color system also based on Munsell color theory. The American Newspaper Publishers Association (ANPA) developed a palette of 300 spot colors for use in usage in newspapers with high volume press runs. 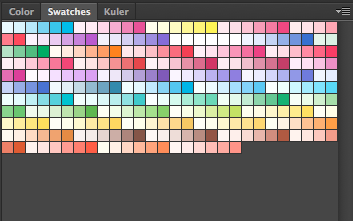 The ANPA index color selector. The Pantone® Matching System© is available for reference use on IOS devices from the iTunes store as “myPANTONE”. And though it is already plugged into Adobe software applications, the ”DIC Colorguide” is available as a free app from the iTunes store.